Growth factors such as TGF alpha and their respective receptors play a crucial role in regulating cell differentiation, proliferation and survival. TGF alpha stimulates cell proliferation and is expressed in a number of tissues including skin, colon, liver and kidney (Kumar et al. 1995). TGF alpha is one of seven epidermal growth factor receptor (EGFR) ligands (Singh et al. 2016). TGF alpha is synthesized in a precursor transmembrane format, which undergoes proteolytic cleavage to generate the mature extracellular soluble ligand (Singh et al. 2016). 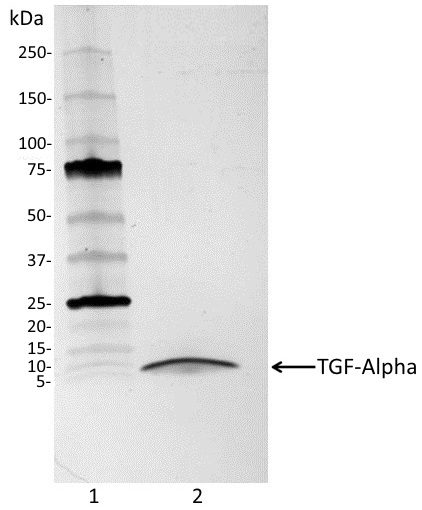 Membrane bound TGF alpha is also biologically active and induces juxtacrine signaling by binding to EGFR on neighboring cells (Schneider and Wolf 2008). Upon TGF alpha binding, the EGFR dimerizes resulting in its phosphorylation and kinase domain activation. EGFR phosphorylation activates cell signaling pathways, such as Raf/MEK/ERK1/2 and PI3K/AKT/mTOR pathways (Wang et al. 2012). Overexpression of TGF alpha is observed in numerous cancer types including triple negative breast cancer and prostate cancer. TGF alpha plays a key role in proliferation and metastasis of tumor cells (Giricz et al. 2013, Qin et al. 2014). In addition to tumors, increased TGF alpha levels have been observed in the gastric mucosa of patients suffering from the hyper-proliferative stomach disorder, Ménétrier’s disease (MD), which has resulted in the implication of TGF alpha in the pathogenesis of MD (Huh et al. 2015). 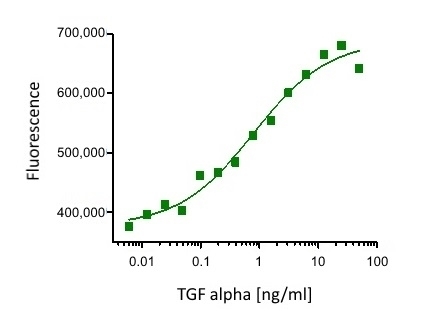 The proliferative effect of TGF alpha was demonstrated by performing a cell proliferation assay with Balb/3T3 mouse embryonic fibroblast cells. The expected ED50 for this effect is 0.1-1.0 ng/ml. Centrifuge vial prior to reconstitution. Reconstitute to 100 μg/ml by adding 100 μl ddH2O. Care should be taken during reconstitution as the protein may appear as a film at the bottom of the vial. Bio-Rad recommend that the vial is gently mixed after reconstitution. Do not vortex. Centrifuge vial prior to reconstitution. Reconstitute to 100 μg/ml by adding 1 ml ddH2O. Care should be taken during reconstitution as the protein may appear as a film at the bottom of the vial. Bio-Rad recommend that the vial is gently mixed after reconstitution. Do not vortex. Confirmed by performing an alamarBlue® based cell proliferation assay using human breast cancer cells. The expected ED50 for this effect is 0.1 - 1 ng/ml. Prior to reconstitution store at -20oC. Following reconstitution store at -20oC. Storage in frost-free freezers is not recommended. Avoid repeated freezing and thawing as this may denature the protein. Should this product contain a precipitate we recommend microcentrifugation before use. Giricz, O. et al. (2013) TACE-dependent TGFα shedding drives triple-negative breast cancer cell invasion. Int J Cancer. 133 (11): 2587-95. Huh, W.J. et al. (2016) Ménétrier's Disease: Its Mimickers and Pathogenesis. J Pathol Transl Med. 50 (1): 10-6. Kumar, V. et al. (1995) Transforming growth factor alpha. Cell Biol Int. 19 (5): 373-88. Qin, W. et al. (2014) MicroRNA-124 regulates TGF-α-induced epithelial-mesenchymal transition in human prostate cancer cells. Int J Oncol. 45 (3): 1225-31. Schneider, M.R. & Wolf, E. (2009) The epidermal growth factor receptor ligands at a glance. J Cell Physiol. 218 (3): 460-6. Singh, B. et al. (2016) EGF receptor ligands: recent advances. F1000Res. 5Sep 08 [Epub ahead of print]. Wang, C. et al. (2012) Transforming growth factor alpha (TGFα) regulates granulosa cell tumor (GCT) cell proliferation and migration through activation of multiple pathways. PLoS One. 7 (11): e48299.